Training is every Thursday at Our House Studios in Ringgold GA. Arrive at 6:20 to get prepared for class and warm up. Class starts at 6:30. ​We work obstacle techniques, strength training exercises, obstacle efficiency and more. We have plenty of obstacle practice with Spartan SGX coach Jason & beginner training with Julie. The facility houses Spartan's Olympus, rope climbs, rings, spear throw, monkey bars, 4', 6' & 8' walls. Peg climb, rigs, full gym facility and more are other obstacles to play on at Our House studios. The twister is coming soon. 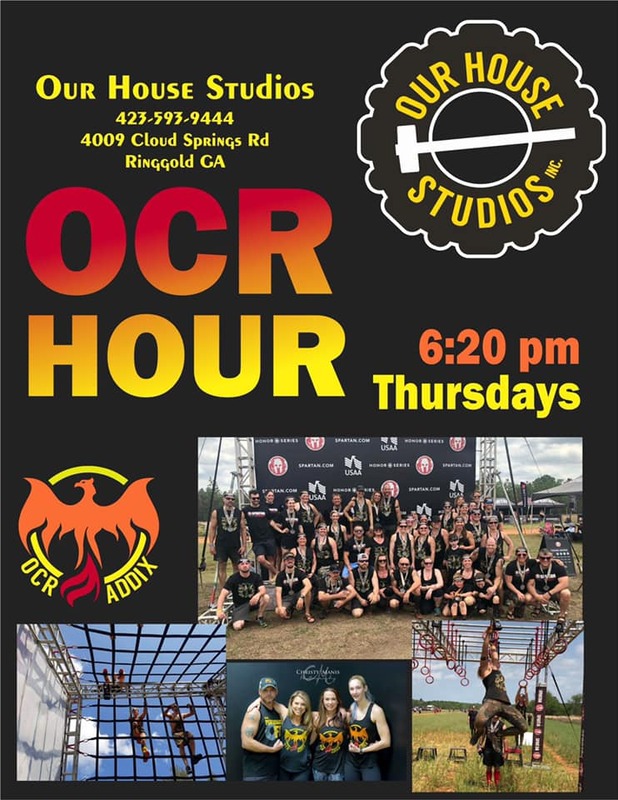 10 weeks of OCR for non-gym members is only $99. Click here to Sign up for your OCR courses! OCRaddix offers a unique team atmosphere to race in. There is no "fee" to be a part of the OCRaddix team. Check our facebook page for gear ordering. We have elite, age group and open heat racers. For those of you looking to run age group, the rules are simple and no help can be given on the course. The addix role in your race is training, motivation and race day cheering section. ​We run all brands of races and do not favor one over the other as a team. Ask any of our members about their favorite races and it will vary on answers! ​For open racers, the team will start together at the start time designated by the race company. You are not required to stay with the team and may run your own race. For new racers, do not worry, we will not leave you. One of the Addix coaches, pro-team members or ambassadors will stay with the pack. The goal of this group is to simply finish the race, have a great time and leave no one behind! You can receive help on most obstacles in the open waves and that is what we are here for. Ready to rock your first race? Click the link below to sign up for your first Spartan race. Race schedule for 2019 ( subject to change and additions). Be sure to download the OCR Buddy app tp stay up to date on races.